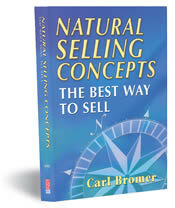 The author's clientele includes manufacturers, distributors, consultants, thirty-year salespeople, entry-level salespeople and individuals selling virtually every kind of product and service. Prior to his current career in sales training, Carl Bromer served as a technician at Kennedy Space Center on the Apollo 4 through the Apollo 12. He also served in the U.S. Air Force as an F-4 fighter pilot; worked as National Sales Director for an international training corporation; and worked with Texas Istruments, Hamilton Avnet (Electronics Component distributor) and Eskco (where he was responsible for sales, manufacturing, and distribution).